For most people, the term ‘rosacea’ implies ‘redness’, but it’s much more complex than that. It mainly affects the skin on the face and neck, although can sometimes spread to the chest, ears and scalp, as well as cause itchy eyes. It can present itself in flare-ups and remission phases. This redness may develop into, or be accompanied by, red bumps (similar to acne). Rosacea may also lead to dry, tight skin and dry, itchy eyes. The causes of rosacea are still not completely understood. It tends to affect more women than men, and is more common in fair-skinned people. Flare-ups can occur for a number of reasons, and each individual’s skin will have its own particular triggers, just like allergies. Some triggers may include, hot or spicy food, alcohol, temperature extremes, exposure to sunlight or UV rays, stress, saunas, and ingredients in skin care or make up products. Bespoke facial peels to help reduce rosacea and help even out skin tone. Gentle light technology that can help encourage the production of fresh new collagen. Skin resurfacing light treatment to help improve skin's texture, reduce redness and target inflamed blood vessels. One of the most important things is to keep track of what may cause each flare-up; some find it helpful to keep a diary of no-go ingredients in skin care products they’ve had problems with. Generally, it’s best to go for products that are fragrance-free, allergy tested and do not contain alcohol. As rosacea can be exacerbated by UV rays, it’s also important to wear a high SPF sun cream when spending time in the sun. Can I get rid of rosacea? 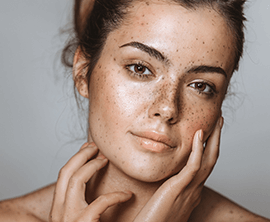 There’s currently no cure for rosacea, but at EF MEDISPA we have a variety of treatments that have been used to reduce the effects of rosacea and minimise the appearance your symptoms.